Steven Schlossman, professor of history and director of undergraduate studies, has won the 2016-17 Elliott Dunlap Smith Award for Distinguished Teaching and Educational Service in the Dietrich College of Humanities and Social Sciences. "I am truly honored to receive the 2017 Elliott Dunlap Smith Award," said Schlossman. "The award reflects the very high standard of creative teaching, as well as research, that the entire History Department faculty has stood for since my arrival on campus in 1988." Since joining Carnegie Mellon University, Schlossman has distinguished himself as a scholar in a wide range of social and political history studies including homework in American schooling, juvenile courts and delinquency and the rise of modern golf. He also helped to co-found the ethics, history and public policy major, offered jointly with the Department of Philosophy. "Steve Schlossman’s nomination for the Smith Award was quite compelling, not least because it was organized by a core group of alumni," said Joseph E. Devine, associate dean for undergraduate studies. 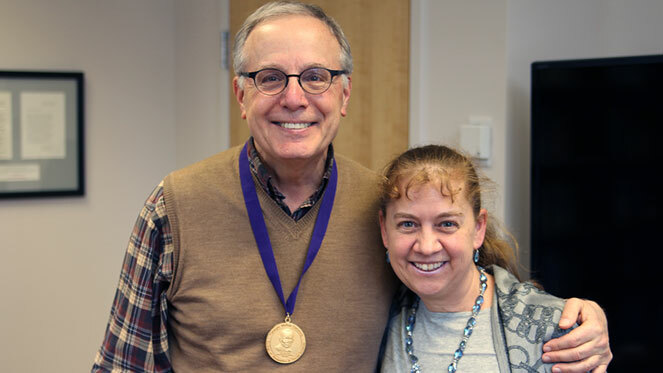 "But it also reflected a remarkable scope and profound influence and impact of a gifted teacher and his dedication to his students, as well as an educator whose influence has been powerfully felt in the college, the university and beyond." While Schlossman’s work as a historian merits incredible distinction, his dedication to his students truly sets him apart. Brian Gill (DC‘89), who received his B.A. in history and philosophy, led the effort to organize Schlossman’s nomination. He said, "I think he is incredibly creative as a teacher in examining unconventional topics, like the history of sports or homework, and exploring their broader implications for social history. He also sets high standards. He had the expectation that I would act like a professional historian even when I was an undergraduate. Combine that with his incredible dedication and willingness to devote time to each student individually." Gill added, "He was the perfect candidate, and I’m just delighted that the college has decided to honor him." Jessie Ramey (DC’09), who received her Ph.D. in history and also helped organize Schlossman’s nomination, noted his "long history of collaborative work, which remains highly unusual in [their] discipline." "He has co-authored (as the more senior colleague) a number of significant articles on a range of historical topics, further demonstrating his commitment to teaching and learning as lifelong endeavors," Ramey said. In her letter, History Department Head Donna Harsch vouched for the success of Schlossman’s collaboration with seniors in the social and political history capstone course. "These papers stand as impressive testimony to the high quality of education offered to majors in Dietrich College and, in particular, to the value of working closely with an experienced teacher who is also a well-seasoned and productive scholar," she wrote. "They did the college, department and instructor proud!" Schlossman’s role in shaping his students’ academic careers may best be represented by Adam Lazaurs (DC’06), who received his masters in professional writing and went on to co-author the book "Chasing Greatness: Johnny Miller, Arnold Palmer and the Miracle at Oakmont" with Schlossman. "I am not exaggerating or stretching the truth to say that enrolling in [Schlossman’s History of Golf course] changed my life…. I learned how to be a true historian," Lazarus wrote. Pictured above are Steven Scholossman (left) and Jessie Ramey.